The price needs to break above resistance at $1,360 to confirm that the next bull cycle is underway. Once this occurs, our analsyis suggests that the gold price will quickly climb back to all-time highs around $2,000 per ounce and then push to $3,000 per ounce by the end of 2020. The last two gold bull cycles propelled the gold price up 4X and 2.3X, respectively. If the current advance comes in somewhere between these new multiples, such as 3X, we can expect the gold price to continue above $3,000 per ounce during the current cycle. The banks almost always undershoot in their price forecasts for gold and silver. They hate the metals and would prefer to push their clients into other investments where they generate better fees, control the funds and keep the fractional-reserve fiat monetary system alive. So, take their estimates with a big grain of salt. Silver has been leading gold higher in recent months. 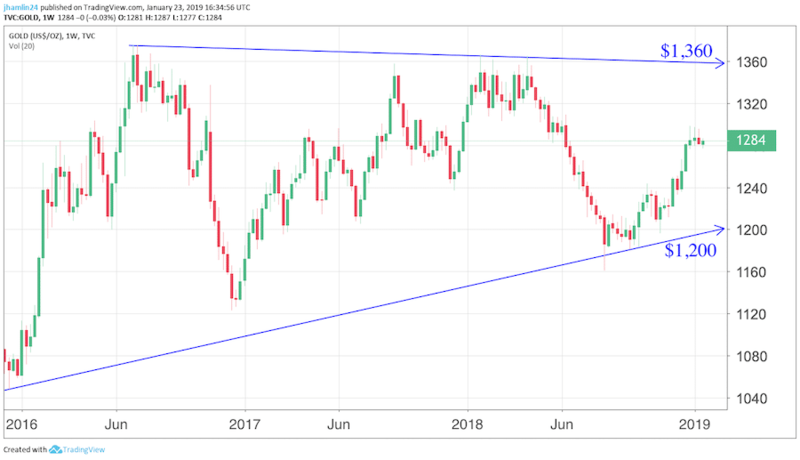 With the gold-to-silver ratio above 84 at the start of 2019, silver looks undervalued relative to gold and has the potential to outperform over the next few years. 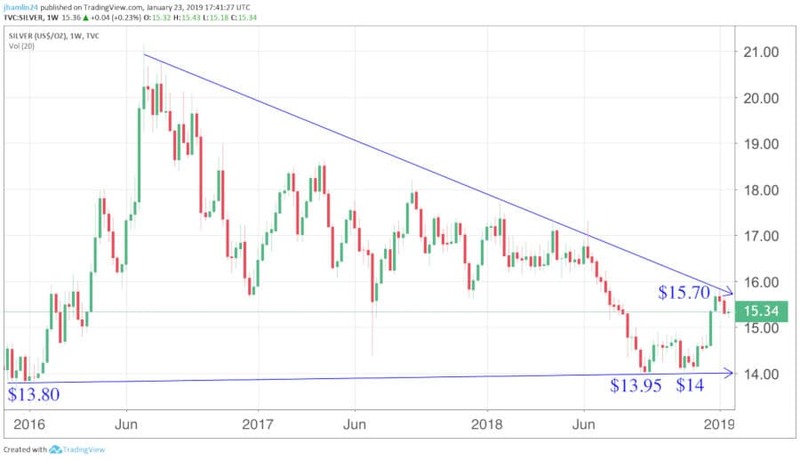 The technical chart for silver shows the massive advance from 2004 to 2011, with the silver price going up roughly 10x from $5 to $50. It has since collapsed by 70% to support around $13 and looks to be basing and starting a new uptrend in 2018. I believe the silver price will climb back above $50 at some point before 2020. A 5.5x gain from the low, as happened during the last upleg, gives us a price target of around $75 per ounce. If you want to follow our take on the precious metals market, including when to buy, which mining stocks are the most undervalued and when to take profits off the table, sign up for the premium membership. You will get instant access to the GSB portfolio, our top stock picks, the monthly contrarian newsletter and weekly trade alerts. You will also get our top cryptocurrency picks, cannabis stocks picks and more.